An annual celebration of bar culture for charity. 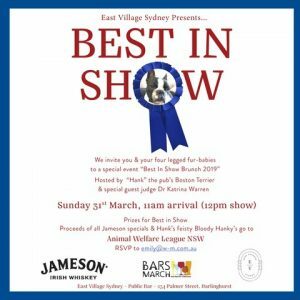 We invite you and your four legged fur-babies to a special event "Best in Show Brunch 2019" hosted by "Hank", East Village Sydney pub's Boston Terrier & special guest judge Dr Katrina Warren. It’s the Bars March 2019 Wrap party too! Prizes await for Best in Show. Proceeds of all Jameson specials and Hank's feisty Bloody Hanky goes to Animal Welfare League.